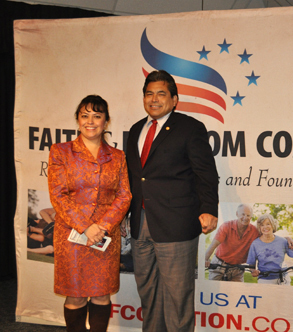 The Texas Rally for Faith and Freedom was a gathering of Political Leaders and Activists organized by the Faith and Freedom Coalition of Texas. The Faith and Freedom Coalition is an organization that offers hope for America; after all faith and freedom make America great! 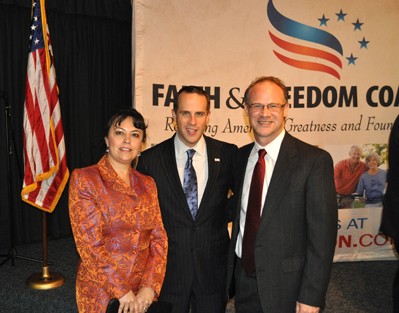 One of the purposes of this organization is to mobilize conservatives and people of faith to vote their values. The Faith and Freedom Coalition distributes voter guides to inform the community to where the candidates stand on the issues. Faith and Freedom Coalition Executive Director Gary Marx explained to the audience with a powerful powerpoint presentation how they are committed to educating, equipping, and mobilizing people of faith and like-minded individuals to be effective citizens. Mr. Marx reminded us of our Constitutional principles and valued discussed the reclaiming of our American exceptionalism and cultural values. 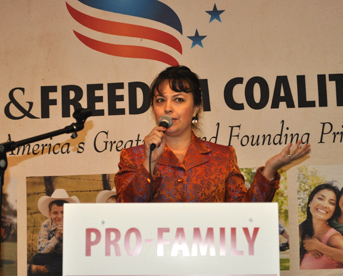 I was able to share about why as a voice for conservative Hispanics, VOCES Action serves to inform and empower Hispanics to express their conservative social, fiscal, and moral values in order to help our nation regain and preserve its moral heritage. As a non-profit organization under IRS reg. 501(c)(4), VOCES Action can engage in political advocacy and explain why the Latino vote is important. Latinos are people with values of faith and freedom and there is a vital need for conservatives to change their rhetoric and approach to engage the Latino community with the common values that we have of faith and freedom. Besides my participation, we also heard from other speakers including: Texas House Representative Charlie Howard, Fort Bend County Commissioner Andy Meyers (Precinct 3), Associate Pastor Dennis Woods of Sugar Creek Baptist Church, Dallas Mayor & U.S. Senate Candidate Tom Leppert, FFC Executive Director Gary Marx, national pollster & President of The Polling Company Kellyanne Conway, former U.S. Representative Tom Delay, Pastor Jerry Bryan of Southwest Baptist Church, Texas Supreme Court Justice David Medina, and Rabbi Ron Aaronson of Congregation Beth Messiah Synagogue. These speakers contributed significantly to the largest turnout of conservative and faith-based voters recorded in any election since exit polling began.